RSG’s frameworks for the in-house legal community are based on over 20 years’ research with general counsel and analysis of how legal functions perform. 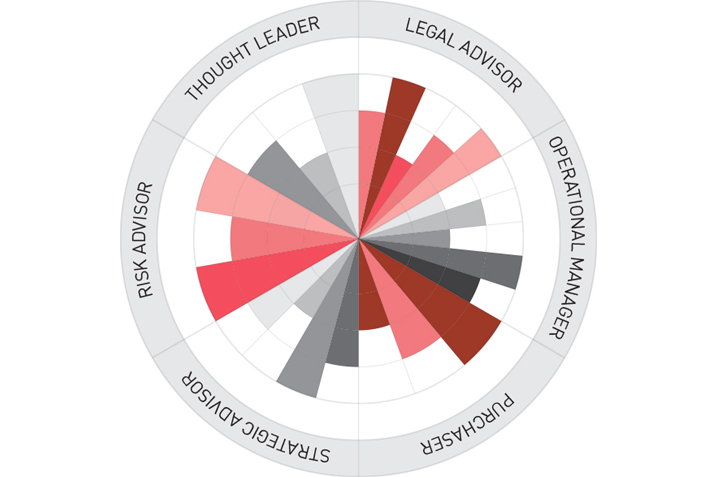 In particular, RSG has taken a deep dive into innovation in-house through the FT Innovative Lawyer reports and analysed over 500 corporate legal functions in the six areas shown. We run workshops and administer two proprietary diagnostic tools to help in-house legal teams get a sense of their own value and market performance with a view to accelerating their ability to innovate. Communicating Value: We run workshops and role-play exercises for in-house legal teams that help them define, develop and communicate an internal ‘brand’ for their functions. A legal department’s brand conveys the essential values and mission of the legal department, and should be aligned with the company’s values. The brand defines how your stakeholders and clients experience the team. The exercise, called ‘Acting the Brand’ is a powerful tool for in-house away days to galvanise teamwork and focus in-house lawyers on a big picture view of their functions. Value Assessment: RSG provides a toolkit to measure and compare how in-house lawyers deliver value in the areas of service, expertise, commerciality and leadership. Perceptions of lawyers and their internal clients are compared to reveal areas of alignment and disconnect, which enables management teams to put together meaningful development plans for individual team members.